Whole project remotely coordinated with Tokyo. Wrote the tune, sent with a guide melody, Tokyo recorded test vocals, I took the test vocals and added chorus lines with autotune, sent back along with notation, recorded chorus lines in Tokyo (they sent all lines melodyne corrected), and mixed back here in NY. Pretty nice workflow that I've perfected with my buddies in Tokyo. (I'm told this is the singer... apparently I didn't know anything while I was writing the tune lol) Though I do think that the feel for the tune ended up matching her character pretty well. 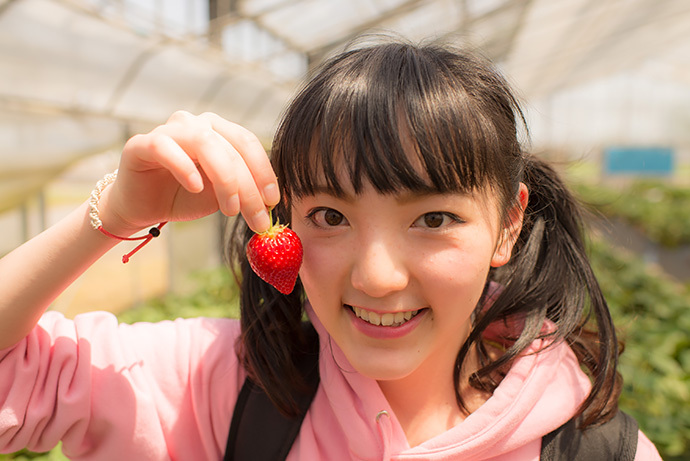 The lyrics are abundantly in Japanese, basically a promo tune to promote strawberries and all the local varietals. Promoting local produce sales I guess. My instruction was to make a bouncy tune and work with this vocalist I knew nothing about. (didn't even know her range) I basically kept the entire melody in 1 keycenter, and also kept the melody line simple. I moved keycenter around too much in a previous project (with a very advanced vocalist) and had a hard time, so kept it simple this time. I like the chorus lines. Maybe a bit too "hug"-ish moving all in unison most of the time. Not the most human lines I've written. It was probably too hard for a the vocalist to execute well without melodyne. But I was expecting lots of correction anyway. Kudos to the engineer that had to do all the melodyne tweaking. He was wise in asking for notation of all the chorus lines. You can compare the test vocals+autotune chorus vs final version. I think they did a good job in Tokyo to recreate chorus lines pretty much the way I played it with autotune. There's going to be a live performance somewhere in Tokyo on 7/31st Tokyo time. Hopefully I'll get to see a video of it. Maybe they'll sell some strawberries. So anyway, my principle with autotune is this. Use autotune / melodyne at the most strategic points to assist in writing great lines, and to boost production speed, but all towards getting the most productive "final" studio session to get all the parts. Melodyne fixing after that is just to get it to sound right. I think we relied on tech a lot to get the vocal parts, but I don't think we over did it to the point of the robot voice becoming the primary voice, while reaping all the benefits of what autotune affords. 1. slap-ish bass: synthmaster factory preset tweaked to super tightness. 2. scratchy sound: custom patch in Alchemy that I spent like 2 days preparing because I always wanted a scratcher patch. It's not perfect, but I was trying to get it close enough since I used to trick DJ with lots of scratching. (with like.. non-traktor records back in the day) Actually having done this stuff helps. 8. twinkly stuff in intro: custom Alchemy patch with a bunch of twinkly granular elements. 10. vocals / chorus: comp / eq on mixbus 32c channel for minimal refinement. Minimal tapesat on bus channels (built into Mixbus). Recording was very good so didn't mess with it much. 11. master: LVCAudio Preamped with "TapeD" model type with no extra drive, Waves L1. Preamped "TapeD" model is totally sweet, you should try it. I can't live without Preamped. After hearing the final recording.. well, I'm kicking myself for not exploring her lower range more, since it sounds much more adult and expressive. I think it's easy to use a girl's belting range to sort of bring the near "yelling-ness" to the front, which isn't what you hear everyday unless your gf or wife is constantly yelling at you. But I see that as sort of a cheap shot, since I feel the belting range is actually has very limited range of expression. Of course, in the context of selling strawberries, maybe emotional expression isn't super valuable. (I was going for a near cheer leader sort of feel) From the recordings I can tell she's still not a very skilled studio vocalist (yet), so maybe we can work on something more technical in the future once she has more experience. Even with a bunch of melodyne fixes though, I think she did quite well with the difficult chorus lines for a first time recording. the score for lead and chorus line if interested. Very nice music, for German ears certainly a different style of music we do hear. The final mix has extreme radio compression but you hear all the details perfectly. Very well done! Excellent ! Fun ! The scratchy sounds are perfect ! How did you get that ? With sample ? Does Alchemy load samples ? Excellent ! For some scratch sounds, I like to use "Grossbeat" from Image Line, it's a completly unique concept of vst's and the result is very good. But it's not usable like you did : a scratch sound on midi note, it's totally different concept. haha, their Aww and Fresh scratch is very good! But ya, it's seems more a product of detailed env curve editing and totally different from what I was shooting for.